PARIS — The French interior minister, Gérard Collomb, called her appearance “shocking.” Marlène Schiappa, the minister of gender equality, said she exhibited a “manifestation of political Islam.” The satirical magazine Charlie Hebdo put her on its cover with a drawing that many considered racist. 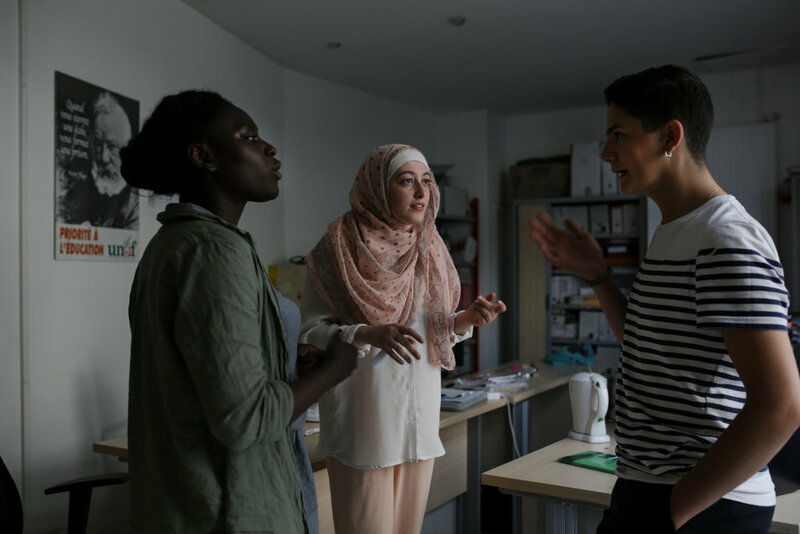 Elected last December as the leader of the Sorbonne chapter of the French National Students’ Union, Maryam Pougetoux, 19, is used to hearing from those who disagree with her progressive views. But she was entirely unprepared for what happened last month after she criticized recent changes in educational policy in the interview. Ms. Pougetoux, a practicing Muslim who wears a head scarf that covers her hair and neck, had been asked to comment on one of the main television channels, M6, about proposed changes that would make admission to universities more selective. She and the hordes of students who took to the streets recently in protest consider the measure discriminatory and elitist. In a Twitter post, Mr. Bouvet said, “we aren’t hunting anyone but merely pointing to the inconsistency” of a leader of the student group wearing a head scarf. “How can one defend values like abortion and feminist principles while displaying conspicuously their religious beliefs,” he asked. Still, she realized not everyone shared her sense of humor. “I was extremely hurt when I realized that it caused a lot of pain for my family and friends,” she said. Not surprisingly, she has received plenty of support from her peers. A sparkle came to Ms. Pougetoux’ blue eyes as she thanked the young man. She has been receiving similar demonstrations of support over the past two weeks on her university’s campus, on the streets of the French capital, and online. But the entire experience has been quite an ordeal for the 19-year-old, who is studying literature and communications. Ms. Pougetoux did not break any law. While head scarves and other religious symbols are banned in public service and in primary and secondary public schools in France, they are permitted on college campuses. Moreover, one expert said, the concept of laïcité should not be used to stigmatize minorities but instead to ensure freedom for everyone. You can finish reading the story on the New York Times' website.